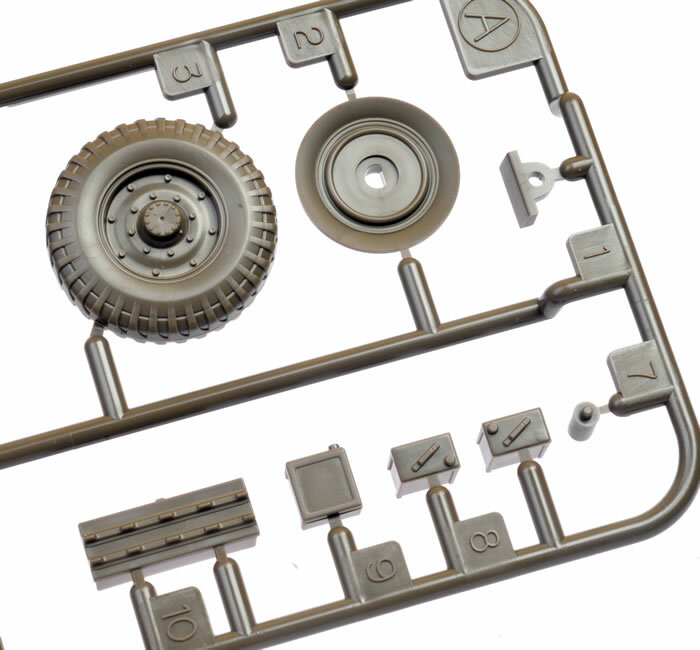 Contents and Media: 81 parts in olive coloured plastic plus markings for one vehicle. 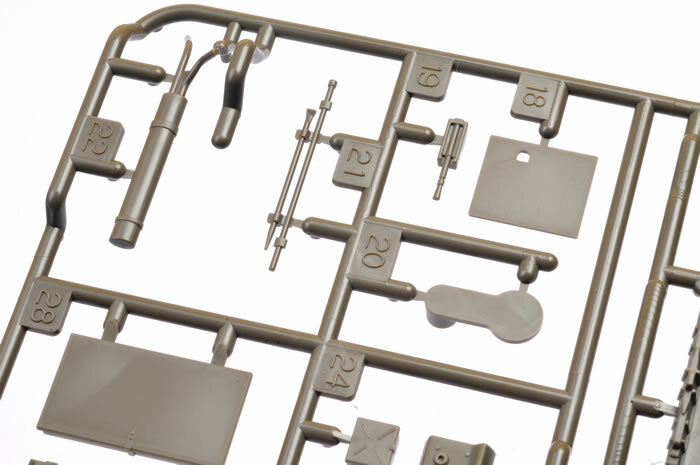 Advantages: Simple construction; excellent surface features; good level of detail; includes Commander figure. Disadvantages: Solid plastic spotlight lens; some simplified detail. The Humber Armoured Car was one of the most widely produced British armoured cars of the Second World War. It supplemented the Humber Light Reconnaissance Car and remained in service until the end of the war. Manufactured by the Rootes Group, the Humber was essentially a combination of the Karrier KT 4 artillery tractor chassis and the armoured body of the Guy Armoured Car. The KT4 was already in production for the Indian Army, and Guy were having problems with the production levels required. The Karrier name was dropped to avoid confusion. The first order for 500 was placed in 1940. The first Humbers were more or less identical to the Guy down to the faults in armour but this was rectified. Production started in 1941. The Mark III improved upon the Mark II by providing a three-man turret. Mark III production ended in 1942 after 1,650 had been built. With a possible replacement, the 2-pounder armed Coventry armoured car, on its way, the Mark IV was designed. This put the US 37 mm gun in the turret but at the cost of one crewman. The Coventry was not ordered as a replacement and so production of the Mark IV continued for a total of 2,000 despite its flaws. The vehicle was used in the North African Campaign from late 1941 by the 11th Hussars and other units. It was also widely used in the European theatre by reconnaissance regiments of British and Canadian infantry divisions. A few vehicles were used for patrol duty along the Iran supply route. A British Indian Army armoured car regiment, partly equipped with Humbers, served in the reconquest of Burma. 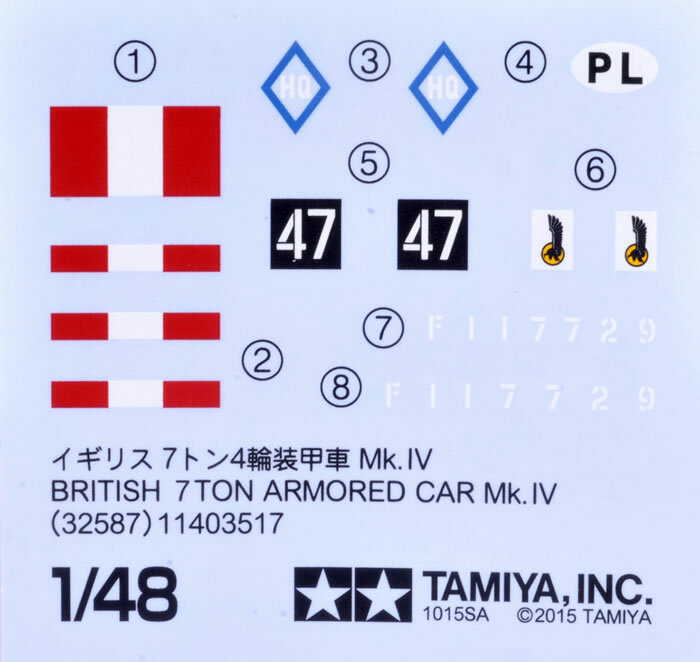 Tamiya continues its ongoing commitment to 1:48 scale military models with this brand new Humber Mk.IV labelled coyly, but quite descriptively, as “British 7 ton Armored Car Mk.IV”. 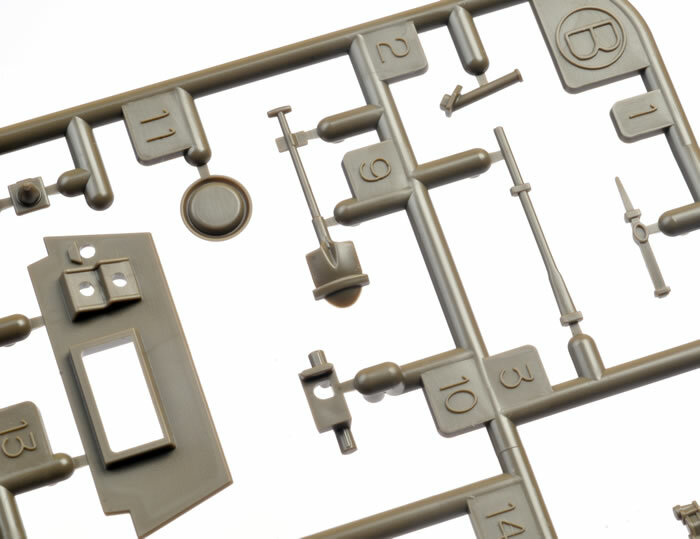 The kit is made up from 81 parts in olive coloured plastic – one main sprue and small twin sprues with running gear and stowage parts - plus markings for one vehicle. Despite its relatively small size, the kit offers separate crew hatches, separate driver’s visor, rotating turret and elevating gun. Surface detail is excellent, as you would expect. 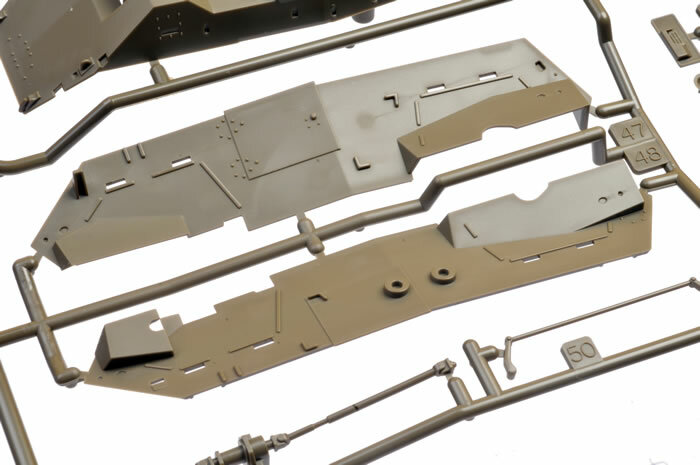 It comprises mostly raised detail for the hatches, doors and rivets, plus nicely moulded hinges. Ejector pin circles are limited to areas that cannot be seen once the model is built. A nicely sculpted and well animated Commander figure is supplied. On vehicle equipment includes various tools, POW cans and stowage boxes. The spotlight lens is provided as a solid olive-coloured plastic part. 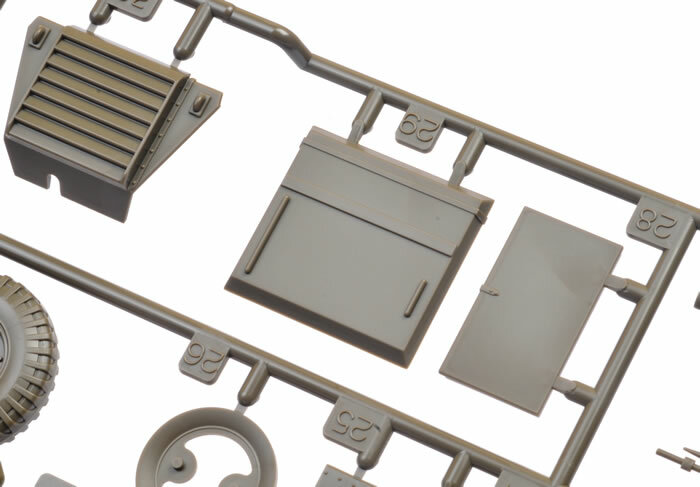 A few of the details are a bit thick or overscale, including the front brush guards and the smoke dischargers. The tyres are moulded in two pieces each from polystyrene plastic and the outside hub and tread texture look good. There is a small raised moulding seam along the centreline of each tyre and not really any detail on the back of the wheels. 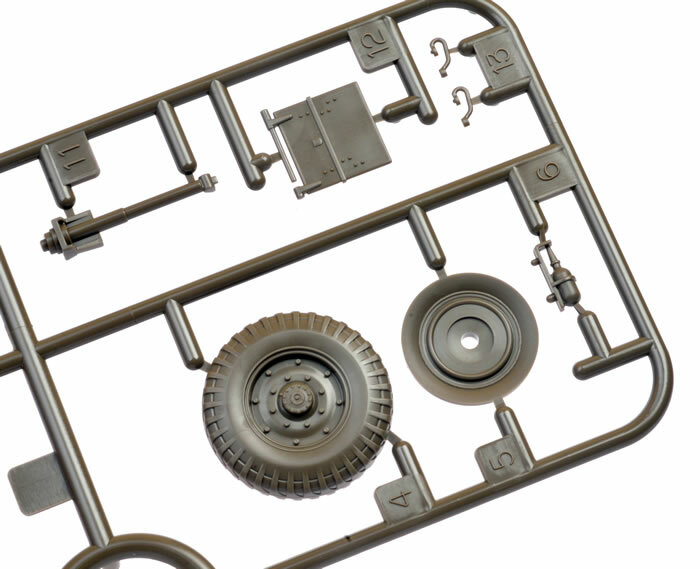 The wheels are attached to the axles by simply gluing them in place – no poly caps here. Markings are supplied for a single vehicle in overall dark gree. I really like Tamiya’s 1:48 scale Military Miniature Series. 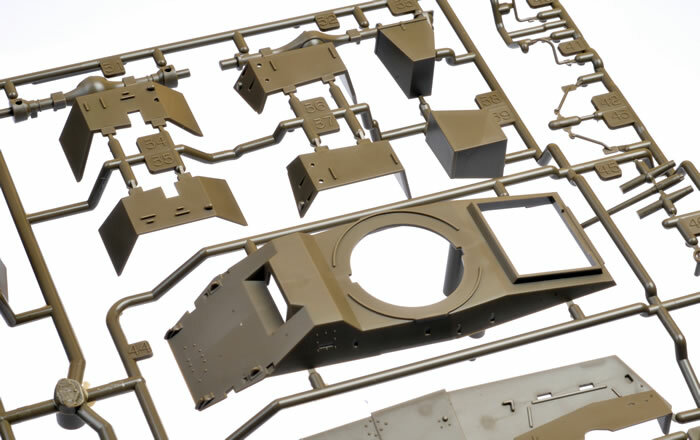 The models are generally well detailed, with very high quality surface features. 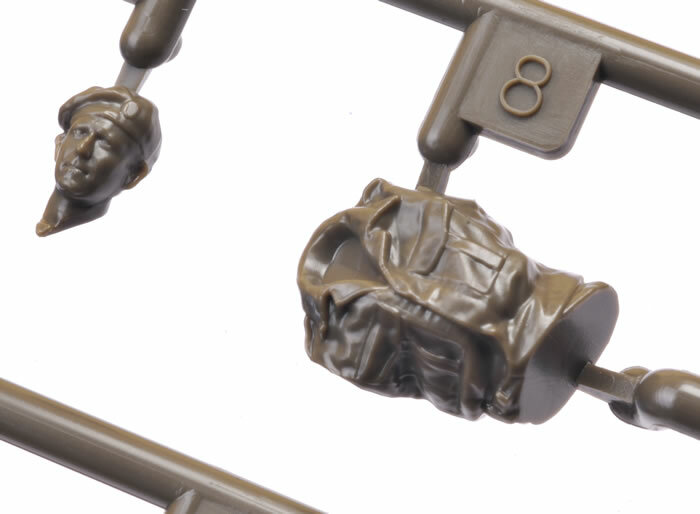 They are fast and trouble free to build, and they are quite compact when complete – ideal for dioramas or as stand-alone displays. 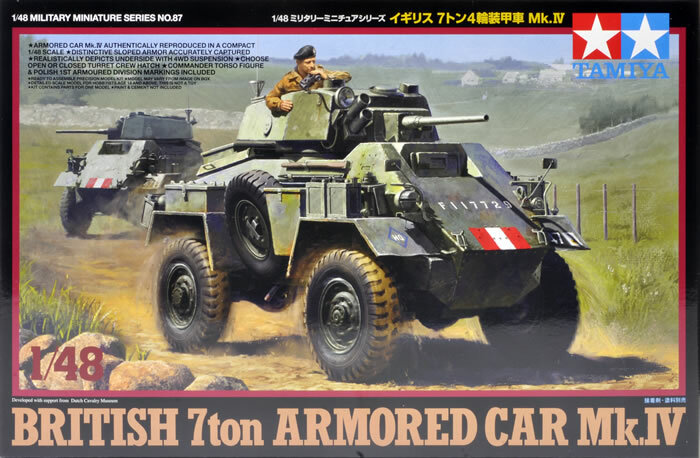 Tamiya’s new 1:48 British 7 ton Armored Car Mk.IV ticks all of these boxes.